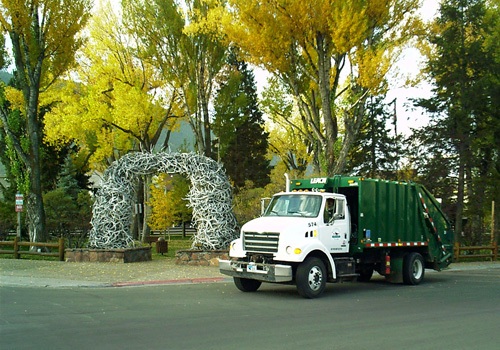 Westbank Sanitation proudly offers reliable and affordable commercial garbage collection for businesses in Lincoln and Sublette County, and commercial trash and recycling service to Teton County, Wyoming. From an assortment of containers to commercial dumpsters and compactors, we have the ideal options to suit the precise trash collection demands of your business. Please call us and let one of our Westbank Sanitation trash service professionals help determine the commercial trash container type and size that is most appropriate for your business' needs. For safety reasons, please do not overfill your Westbank commercial trash containers and to prevent littering, please keep the lids closed at all times. 2 Yard 80" 41" 50" 55"
3 Yard 80" 49" 53" 64"
4 Yard 80" 59" 55" 70"
4 Yard (Bear Proof) 80" 59" 55" 70"
6 Yard 80" 78" 60" 64"
6 Yard (Bear Proof) 80" 78" 60" 64"
8 Yard 80" 78" 51" 82"
These are the only holidays that might affect your Westbank business trash & recycling service. If one of the above holidays falls on a Monday- Friday, everyone's service will be picked up one business day later. (Example: Thanksgiving Day, Thursday customers will be picked up on Friday, Friday customers will be picked up on Monday.) Visit the Schedule page to enter your address and view your collection schedule. What payment types does Westbank accept? Westbank Sanitation accepts payments in cash, by check and from the following credit cards: American Express, MasterCard and Visa. How often do Westbank Sanitation commercial trash customers get invoiced? Our Western Wyoming commercial trash customers are billed at the first of the month and payments are due by the 15th.